A seminal work of German soccer literature. Hardy Grüne has done the impossible: given a basic outline of every single German soccer club that has played 1st-2nd-3rd division level football since 1903. This includes clubs in former German territory, such as Poland, Sudetenland, Memel etc. 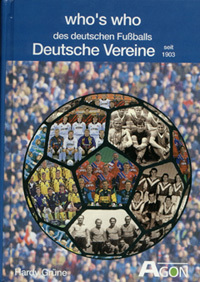 This work is indispensible for doing research on German soccer, as some 1,800 clubs are described. Although it's only the basics, you've got to start somewhere, and this makes it possible. Nevertheless, I can't really recommend this book. Why? Grüne's later works are even better!! The research and attention to detail were expanded. The quality of production is enhanced. This work remains a classic because of it's pioneering nature. But strictly speaking, his Vereinslexikon is superior, while covering almost the same material, and then some (over 3,000 clubs).